Located just south of the most historic part of town in a peaceful and residential district, the Hotel Speedway Marianske Lazne is a good hotel in Marianske Lazne for all kinds of visitors. Guests are close to the Singing Fountain, the Spa Colonnade, Ferdinand's Spring, and the popular golf course. 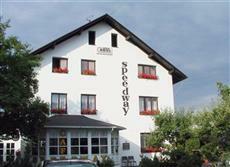 The Hotel Speedway Marianske Lazne is located at Na Pruhonu 329 and is 20.3 miles from the Karlovy Vary International Airport. All of the guest bedrooms will come furnished with high-speed Internet access, satellite TV, direct dial phone service, satellite TV, climate controls, a full-sized bathroom with tub, and room service. Guests of the Hotel Speedway Marianske Lazne will greatly appreciate the fine facilities and services, including a lounge with bar service, a café, skiing facilities, free parking on the premises, pet friendly policies, bicycle hire services, an in-house restaurant, a spa with massage and beauty treatments, private gardens and grounds, a guest terrace, a lounge with fireplace, free daily breakfast service, and 24-hour front desk service.